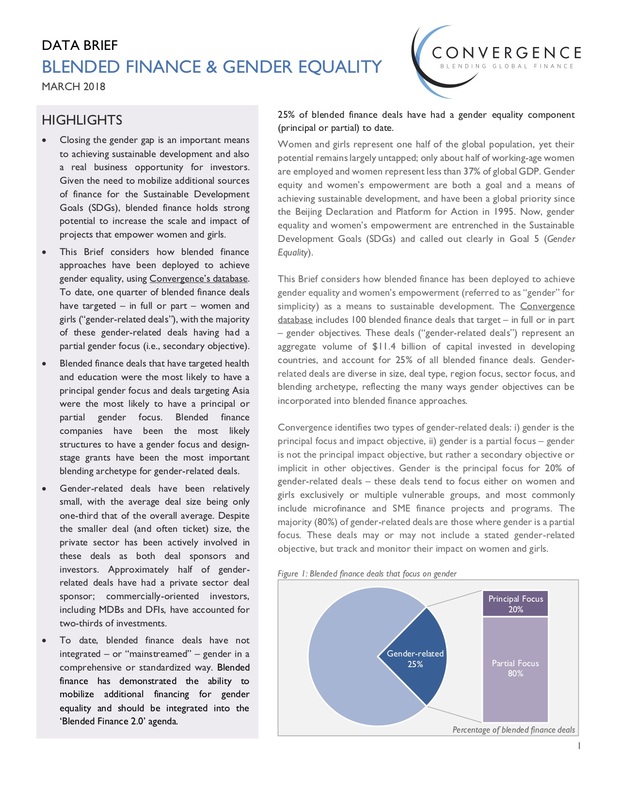 This Brief considers how blended finance has been deployed to achieve gender equality and women’s empowerment (referred to as “gender” for simplicity) as a means to sustainable development. The Convergence database includes 100 blended finance deals that target – in full or in part – gender objectives. These deals (“gender-related deals”) represent an aggregate volume of $11.4 billion of capital invested in developing countries, and account for 25% of all blended finance deals. Gender-related deals are diverse in size, deal type, region focus, sector focus, and blending archetype, reflecting the many ways gender objectives can be incorporated into blended finance approaches.